We have had a busy spring season at the Gallery with a lot of darkroom printing sessions and new black and white work on display. Most of the work was generated by new negatives exposed last fall on the Olympic beaches and in the rain forest river beds. I was able to work in the Queets, Quinault, and the Hoh rivers with good success. Unusually good weather. We are pleased to announce that my work was chosen to grace the walls of the new Virginia Mason Medical Center Bainbridge Island facility. We will have prints placed in the exam rooms and hallways and common areas. We thank the Art selection committee for choosing this work and especially Wendy Garrison, of Wendy Garrison Design, for her excellent facilitation of this process. We are especially proud of all of our many Health care print placements and are looking forward to seeing the new Virginia Mason building when it opens in May. 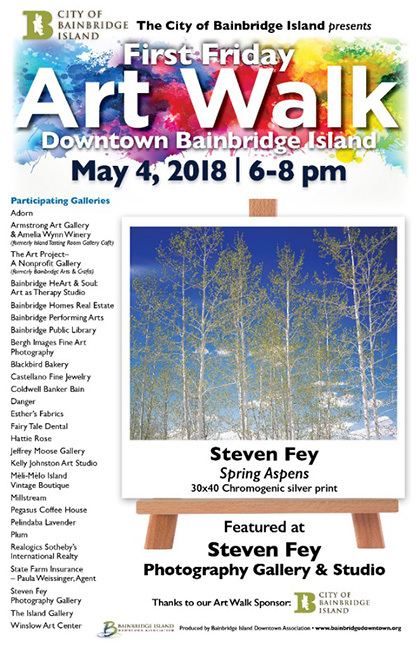 We are the featured artist/gallery for the May 4th Art Walk in downtown Winslow sponsored by the Bainbridge Island Downtown Association and the City of Bainbridge Island. Please join us for the evening. There will be the poster image and other new work on display along with quite a few of the Virginia Mason pieces.